Two Dutch-based designers are trying to minimize the industry’s carbon footprint using live bacteria to dye textiles. Waag Society Textile Academy participants Laura Luchtman and Ilfa Siebenhaar developed Living Colour, a project that combined live bacteria and sound frequencies to naturally dye textiles. The project explored how sound frequencies impacted bacteria pigment growth and how that could promote more eco-friendly production processes in the future. Today, synthetic manufacturing has replaced biological fabrication for textile dyeing. The dyes used to color textiles are often not sourced from renewable materials and could contribute to Earth’s pollution problem. Using a sound installation in a lab, Luchtman made the bacteria vibrate, or dance as she explains it, in order to create patterned fabrics. The sound causes the bacteria to take form in different patterns. What they found was that the sound frequencies also sped up the production of pigment. Bacteria that weren’t combined with sound made stained textiles, while the “dancing” bacteria created plain dyed fabrics. Luchtman found that Janthinobacterium Lividum (JL) was the best for for textile dyeing due to its fast growth and ability to produce saturated pigments. Luchtman said aerobic bacteria could be a more sustainable option for synthetic pigments. Unlike other artificial dyes, some aerobic bacteria can create vibrant pigments, including carotenoids and violacein. With their biodegradable and antioxidant abilities, aerobic bacteria are also a safer choice for human skin. 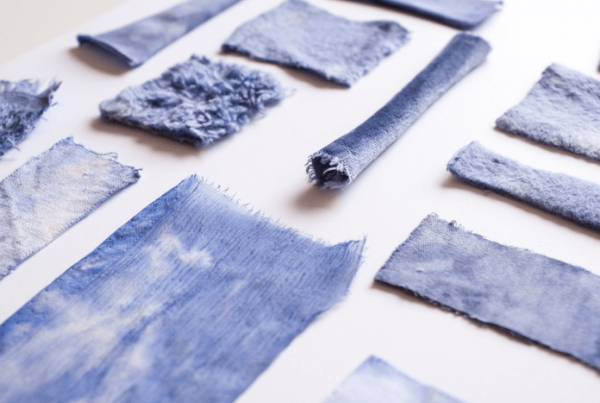 As the fashion industry continues to make sustainable progress with production processes, eco-friendly alternatives, including bacteria dyeing, could be an up-and-coming method of coloring textiles without harming the environment.